Most walkers will climb Driesh from Glen Doll, probably linking it with neighbouring Mayar. However an alternative way to tackle these hills is from the south along an ancient right of way known as the Kilbo Path. Parking for a couple of cars is available a few hundred metres beyond Glenprosen Lodge at the foot of a tarmac road leading into Glenclova Forest. Make sure you do not block the gate, though. Don't head up into the forest but follow the road which drops down to the cluster of cottages and farm buildings at Runtaleave. Follow the track north west and ignore the path which branches off to your right near another cottage. Pass through open fields and you will soon come upon the white- washed walls of the house at Old Craig. Pass through a gate and continue towards Craig Tillelet where a small wood appears on your right. The burn which has been gurgling away down to your left is crossed via a substantial bridge before you pass through a forestry gate. On the current OS map it indicates that the path is bounded on both sides by trees but in fact the area to your right has been felled. It was from this ground that a young deer emerged and bolted across the path into the safety of the woods when I made my way through. The path continues to skirt the plantation and soon the crumbled stone ruin of Kilbo appears by the burn on your right. The ruin makes an excellent picnic spot and is reached by continuing along the path and through another gate where you can cross the water safely by a metal girder. A signpost here points you in the direction of Glen Clova and the track disappears into the trees. The going is likely to be very muddy here because the dense evergreens shrouding the path block virtually all the sunlight in places, never allowing the track to dry out. The first real climbing of the day is done here as you make you way up through the woods towards Cairn Dye. The path leaves the woods and emerges into open heath where another signpost points in the direction of Glen Clova. Up ahead lies 3045 foot high Mayar and to your left is the craggy face of South Craig. Keep climbing up the Shank of Drumwhallo and you will reach the long ridge between Mayar and Driesh where yet another signpost appears. Turn right and follow the line of the fence towards the western face of Driesh. You have to lose some height before you can begin climbing the rocky path which, especially in wet or misty weather, requires a bit of care. Many of the rocks are easily dislodged and it is a long way down! The summit of Driesh is not far away now and you will pass a stone cairn before the substantial stone circle which surrounds the mountain top's trig point hoves into view. From the summit, head in an easterly direction and carefully make your way down the steep slopes, which drop to around 650 metres above sea level, before gaining the 200 metres required to take you to the top of the Hill of Strone. A wooden post surrounded by a small cairn marks the summit and the end of the day's climbing. It's downhill from here on in as you head off towards the Glenclova Forest. Head southwest from the summit, past a line of shooting butts, and into the woods via a large gap in the boundary fence. After a while the path emerges from the trees and into a clearing where you should continue left, keeping the small burn on your right hand side. The track enters the woods again and eventually ends at the gate near where you left your transport. 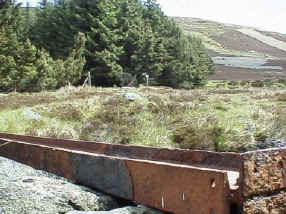 Start/parking Entrance gate at Glenclova Forest (grid ref 290681). Grading No really strenuous climbing but a long walk nonetheless. The ascent and descent of Dreish is fairly steep so proper grippy footwear is a must. Always take a map when venturing into forests.